Last month most of the members of our In Print Writers as Readers book discussion group said they had no trouble finishing our selection – The Language of Flowers. 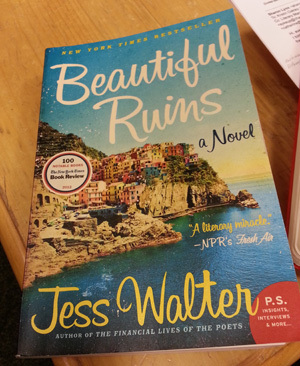 This month several writers admitted they kept reading Beautiful Ruins just because it was our selection of the month. For several, it was a chore, not a treat. And yet, when we started talking about it, we realized author Jess Walter had shown us much worth discussing. Walter’s novel about the intersections of several lives during and after the making of the movie “Cleopatra” was less than straightforward in its style. Its constant structural changes sometimes amused and sometimes annoyed members of the group.